So if your USP is attention to detail and quality of service, then grammar errors and typos kill your credibility. You see, grammar errors detract from the impact of your messages. To make matters worse, they make you look sloppy and signal you don’t care. But it’s easy to be tripped up by grammatical errors. For instance, I have a blind spot where writing the word ‘covenant’ is concerned. When writing blogs for a finance company, I always spell it ‘convenant’. Fortunately, the spell check picks this error up every time. But for other words I know I cannot rely on spell check. You see, in everyday writing, you encounter many words that sound the same but have different spellings and meanings. 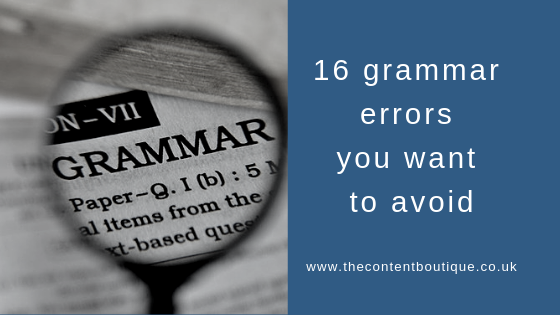 Here is a list of 16 grammatical errors I commonly encounter when I’m asked to edit marketing copy. ‘I advise you not to give advice. Similarly, the words ‘practice’ and ‘practise’ often confound. ‘Practice’ is a noun (a people, places or thing word). Whereas the word ‘practise’ is a verb (a doing word). To compliment means to give praise. In contrast, to complement signifies to go well with or enhance something. The word ‘affect’ is a verb. The word ‘effect’ is a noun. Let’s clarify the confusion over these words, once and for all. Think singular when you use the word ‘less’. Or ‘not as much’. On the contrary, think plural when you use the word ‘fewer’. Or ‘not as many’. And then there are the words we make up. There is no such word as ‘alot’. But people make this mistake ‘a lot‘ of times! Here the problem arises from confusion about the contraction. ‘Whose’ means belonging to whom. Whereas ‘who’s’ is a contraction of ‘who is’ or ‘who has’. On the other hand, ‘you’re’ is a contraction of ‘you are’. Beware of similar sounding idioms. It’s actually, first come, first served. The phrase means ‘the first to come will be the first to be served’. But hang on a minute. Can an Xbox write an essay? The phrase ‘having finished the essay’ is a dangling modifier. It confuses readers and makes copy challenging to read. If in doubt, don’t chance it. Rewrite your sentence to avoid troublesome words and phrases. And always, always proofread your copy. Better still, get someone to proofread it for you. Trust me you’ll be glad you did. If you’d like someone to polish your copy for you, drop me a line about copy-editing services, and we’ll set up a time to chat.